A wise new friend of mine shared this quote and personal mantra of his with me this past November when we were both volunteering in Wallacedene, South Africa. As a society, especially in New York City where I reside, we’ve become very accustomed to powering through long, stressful days and tense situations. Oftentimes this results in a physical tensing of the neck and shoulders and sometimes we may close ourselves off from experiencing new and wonderful things due to lack of time or energy. Now, I don’t know about you but I am only 31 and I’m not ready to close myself off to new experiences just yet! 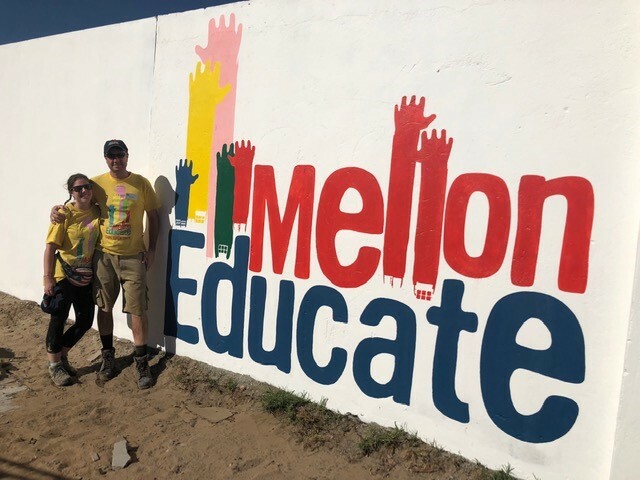 I, along with my dad Sean McGee (and a couple other family members) took some personal vacation time at the end of November 2018 to travel to Cape Town, South Africa with an organization Niall Mellon Educate. This organization was founded and is based out of Ireland and it is their mission to help educate the young children in townships of South Africa. I went in with the expectation that this would be similar to other build trips I had participated in a couple years ago, and boy was I wrong. 300 volunteers spent 6 days (and many more hours behind the scenes) building over 9 classrooms, a kitchen area, a playground, and a sport field for the primary and secondary schools located in Wallacedene, SA. Working alongside the local residents and children was an experience I will never forget; we were able to see through their eyes the immense impact this will have on the future and truly take a step back and realize a deep appreciation for something we here in the US can sometimes take for granted. As Nelson Mandela stated, “Education is the most powerful weapon which you can use to change the world.” Living these words in Nelson Mandela’s native South Africa, was an experience I will never forget. The work was hard but rewarding; a very welcomed break from the norm of conference calls and emails. And while my shoulders were very sore at the end of the week I was able to drop them and open my heart to an amazing group of people and experiences. Thank you to my management and SAP for allowing me to take this time off and give back. I’d love to hear more stories from my fellow colleagues about how you’re giving back on your own time – I know we all have a story! Wishing you all a happy and healthy 2019 and here’s to helping more people in the coming months!